It’s time to re-visit the Safeway brand “refreshe” in all its un-capitalized glory. Today’s flavor of choice is refreshe Cherry Cola, which contains 0% juice. You know how I know this? Well it’s stated on the can silly, if that wasn’t printed on here I bet I’d be wondering all day if there was real cherry juice in here. Sigh… I wish sarcasm had a font because I’d use the heck out of it. How’s about we use Comic Sans as the official “Sarcasm Font”? People would like it more if it were used for the benefit of sarcasm wouldn’t they? I understand that some use Comic Sans ironically, but let’s take it back from the Hipsters and use it for the sarcastic! Surely a large portion of Hipsters are sarcastic so the lash-back won’t be that great. So yet another trend is decided on this site. TheSodaJerks.net: Setters of trends, and nothing more! Wait… we also review sodas. 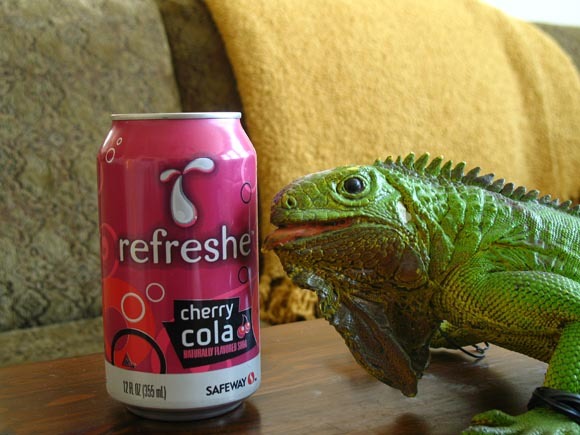 Speaking of… this refreshe Cherry Cola has a very mysterious ingredients list as Natural Flavors are listed alongside HFCS, Coloring agents, and acids. Let’s just open it up and see what we get. The scent test proves refreshe Cherry Cola to be more cola than cherry, which is perfectly understandable. I can discern the cherry scent mind you, but it wasn’t the first thing my nose noticed. Then again my allergies are kicked up today so there’s that. DRINK ON! The first sip is a major disappointment. The cola taste immediately falls flat and the cherry gets crushed underneath it. Swishing it around in my mouth I can feel the cola trying with all its might to intrigue me with bursts of carbonation. “Like me! Like me!” it screams, but once you stop swishing… it quiets down to a whisper. Every sip I take allows the flavor to build on itself which you might think would help its case. No, Ma’am. No, Sir. While the flavor is becoming more pungent it’s just revealing how weak of a Cherry Cola this really is. You can almost taste the chemicals, assuming they are since Natural Flavors are all we’re given. Honestly I hope they are chemicals because if you use real deal ingredients and you make it taste this underwhelming then shame on you. Fortunately the aftertaste vanishes fairly quickly but you’re left with the caustic feel of refreshe Cherry Cola on your teeth. It’s holding on to my enamel for dear life, making my teeth more easily grind when I close my mouth. That’s it. I’m done. I could finish this can, but I see no reason to do so. This is one of the worst attempts at a Cherry Cola, something that should be a treat in any definition, which I have seen in a very long time. Twist doesn't even realize it's there... that's how flavorless it is.